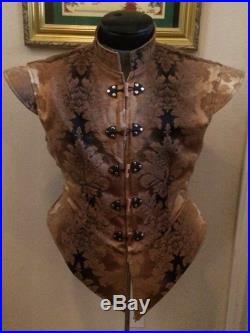 Medieval renaissance doublet / jacketthis handmade doublet comes in sizes small to 5xl. These doublets are made in the great state of texas. We also make them in a variety of other colors and fabrics so if you can't find what you are looking for just send us a message and we will respond quickly. We have had our clothing worn on a variety of tv shows, cruise lines, character actors and acting troops around the world to include the english national opera, spike tv's "deadliest warrior" as well as others.